The wood frog (Rana sylvatica) can endure freezing of up to 65% of total body water during winter. When frozen, wood frogs enter a dormant state characterized by a cessation of vital functions (i.e., no heartbeat, blood circulation, breathing, brain activity, or movement). Wood frogs utilize various behavioural and biochemical adaptations to survive extreme freezing and component anoxia and dehydration stresses, including a global suppression of metabolic functions and gene expression. The stress-responsive myocyte enhancer factor-2 (MEF2) transcription factor family regulates the selective expression of genes involved in glucose transport, protein quality control, and phosphagen homeostasis. This study examined the role of MEF2A and MEF2C proteins as well as select downstream targets (glucose transporter-4, calreticulin, and muscle and brain creatine kinase isozymes) in 40% dehydration and 24 h anoxia exposure at the transcriptional, translational, and post-translational levels using qRT-PCR, immunoblotting, and subcellular localization. Mef2a/c transcript levels remained constant during dehydration and anoxia. Total, cytoplasmic, and nuclear MEF2A/C and phospho-MEF2A/C protein levels remained constant during dehydration, whereas a decrease in totalMEF2C levels was observed during rehydration. Total and phospho-MEF2A levels remained constant during anoxia, whereas total MEF2C levels decreased during 24 h anoxia and P-MEF2C levels increased during 4 h anoxia. In contrast, cytoplasmic MEF2A levels and nuclear phospho-MEF2A/C levels were upregulated during anoxia. MEF2 downstream targets remained constant during dehydration and anoxia, with the exception of glut4 which was upregulated during anoxia. 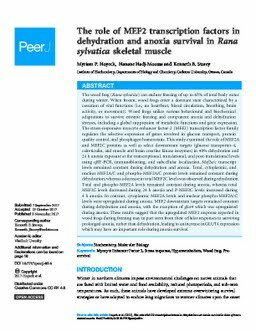 These results suggest that the upregulated MEF2 response reported in wood frogs during freezing may in part stem from their cellular responses to surviving prolonged anoxia, rather than dehydration, leading to an increase in GLUT4 expression which may have an important role during anoxia survival.